I try to keep up on current events and I do my best to share important subjects on the Wilderness Animal Hospital Facebook page. The most surprising article I found was about pets suffocating in snack bags. 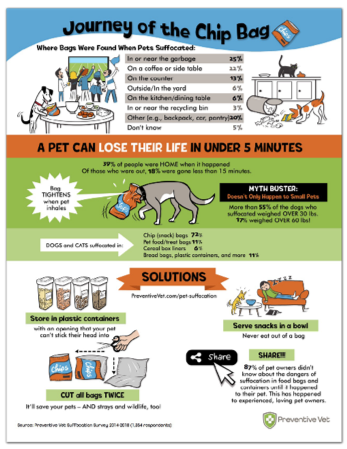 I haven’t seen this in practice, but the statistics noted are that 2-3 cases are reported each week in the U.S. of pets being lost to chip and other snack bag suffocation. In many cases, the owners were only gone from their homes for a short period of time, 20-30 minutes. It can take only a few minutes for a pet to suffocate in a snack bag. There are steps you can take to avoid suffocation by food bags. Transfer food that comes in bags (snacks, cereal, dog food, etc.) into plastic containers and dispose of the bags. When you dispose of the bags, cut two sides of the bag, just like we cut the 6 pack plastic rings to protect wildlife. Lastly, instead of eating out of a bag serve your snacks in a bowl. Next, we will move on to one of my “soapbox” topics. If you follow us on Facebook, you saw the post I copied from Vetdentists.com, What Things Are Bad for My Dog to Chew On? The Veterinary Dental Specialists many good points. Just like humans, hard objects can break teeth. Our dentists advise us against chewing ice cubes, popcorn kernels, and jawbreakers, we should avoid giving our pets ice cubes, rocks, real bones, hard plastic bones, cow hooves and deer antlers. Dr. Patrick Vall was quoted “Don’t give them anything you could pound a nail with, or you wouldn’t want thrown at your knee caps.” It certainly drives the point home and one of my all-time favorite sayings. Chewing is important for dogs, but broken teeth are painful and expensive. When you are choosing your dog’s next chew toy, ask someone to throw it at your knee before you buy it, make sure someone is filming it, it might go viral! Lastly, let me climb up on my biggest soapbox- pet food. The most recent newsworthy item is related to grain free diets. There has been an increase of cases of Golden Retrievers with Dilated Cardiomyopathy, a heart disease secondary to a deficiency of an amino acid, Taurine. This is the same amino acid that was found to be deficient in many cat foods and causing heart disease in cats in the 1980s. The majority of these dogs are on grain free diets that are high legumes (plants from the pea family.) My long-standing question is what is the big deal with grain free diets? Why do people feel they need to feed diets free of grain? Sadly, the biggest reason is marketing. Pet food is a multi-BILLION dollar industry and manufacturers do what they have to do for their market share. I know that buying food for the pet you love can be a very emotional experience, but it is important that you are an informed consumer. I found an excellent website that every pet owner should read to help them make smart decisions about their pet food purchase decisions. Tufts University Clinical Nutrition Service: http://vetnutrition.tufts.edu/ . My favorite articles are on the myth behind grain free diets and how to read a pet food label and choose the company you buy your food from. Learn about what an AAFCO statement means, nutrient profiles for different life stages and if the diet has gone through feeding trials. Feeding trials are expensive, but the best way to make sure a diet doesn’t cause any problems prior to being sold to be fed to our pets. What I found disconcerting is that even foods labeled to be complete and balanced, it doesn’t guarantee the final product was tested to be sure it still met those levels. It is important that the food you choose is made by a manufacturer with qualified nutritional consultants and strict quality control measures. Sadly, fancy marketing and trends without scientific proof often sway our decisions. The summer season has officially begun! The Wilderness Animal Hospital family and dogs loved being part of this year’s Maple Valley Days Parade, proudly following the Tahoma FFA group. It was a little rainy, but that didn’t dampen our spirits. Look for us at the Maple Valley Market. Have a safe and fun summer. Contact us with any questions or input at [email protected] or on our Facebook page.